How would you define the significance of the dining area of your home? Is it only the place where you feed yourself three times a day? Obviously not! Dining area is that special section of the house where you enjoy a meal with your beloved family members and share your everyday experiences with them. It is the place where you hold parties for your friends and enjoy the succulent food, cooked by your mom or spouse. Here kids are scolded for their mischievous behavior and elders appreciated for their achievements. When this place holds so much of importance, it becomes compulsory to furnish it in the most aesthetically pleasing and elegant manner. If you are planning to purchase new dining room furniture, prior to visiting the shop, it is essential to make up your mind and stick to some considerations. What are those? Read on find more about it. 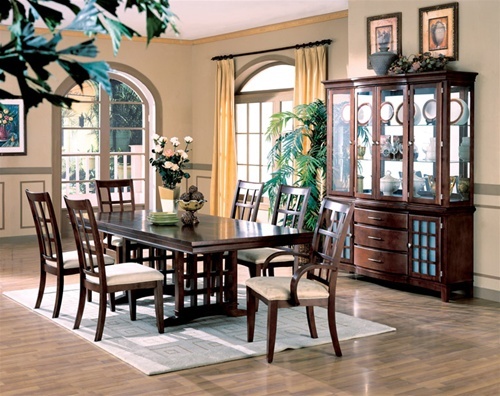 What Dining Room Furniture Style Would Suit You? There are not too many people on your dining table. You don’t have kids in your family or kids will rarely be dining here. It will be responsibly used. You prefer comfort and convenience in terms of cleaning. · Where is Your Dining Area? Now, the next major consideration is the location of the dining area. Should you buy an indoor dining set or an outdoor one? Go through the following criterion and determine which one is more suitable for you. Purchase an indoor set if you have a specific placement in mind. What else should you consider? Here comes the list. You don’t have a backyard or garden with your home. The weather in your region is not reliable or pleasant enough to dine out. You like to spend time outside. You like to eat with the view and scenery before you. Homecinemacenter.com offers you attractive deals on dining sets. For further details on other products like living room sets, entertainment centers and more, check out our website.